Mr. Angel Gurría, Secretary-General of the OECD, was in Chile on 25-26 November 2015 on an official visit. The Secretary-General was received by President Michelle Bachelet, with whom he met bilaterally to advance the collaboration between Chile and the OECD. They also commemorated the 5th anniversary of Chile’s accession to the Organisation, at La Moneda. During his trip to Santiago, the Secretary-General presented the OECD Economic Survey of Chile, participated as a keynote speaker at the opening session of the XXXVII Encuentro Nacional de la Empresa (ENADE 2015), and opened a seminar on the OECD New Approaches to Economic Challenges hosted at the Universidad de Chile. He also held bilateral meetings with several Ministers and high-level officials, as well as Members of the Parliament. Mr. Gurría also received the “Orden Bernardo O’Higgins en el Grado de Gran Cruz”, granted by the Chilean Government. 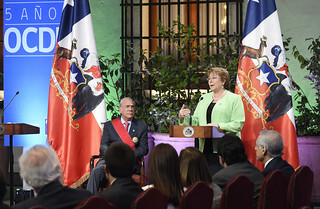 25 November 2015 - OECD Secretary-General Angel Gurría and Michelle Bachelet, President of Chile at the ceremony to mark the 5th anniversary of Chile’s accession to the OECD. La Moneda, Santiago de Chile, Chile.